FRANKIE PLOT SUMMARY: Ever since Degrassi’s alumni gala, Frankie’s avoided going to school because she’s tired of everyone treating her like she’s a racist. She’s been lying to her mom by pretending to be sick, but her mom catches her and Jonah half naked by the Hollingsworth pool. When she’s forced to go to school and she has to deal with no one wanting to work with her in class, Frankie plans to run away; she and Jonah decide to hide out at a cheap motel. Frankie falls asleep, but she wakes up to hear Jonah telling his mom that he plans on talking some sense into Frankie. When Frankie asks Jonah if he thinks she’s racist, he tells her that she isn’t trying hard enough to understand how she’s hurt people with the racist banner and hurting her family by running away. Frankie decides to take Jonah’s car keys and take a drive to blow off steam, but she ends up with a flat tire. Later, she sees a car stop behind her, and when a black man gets out and approaches her car she locks the door. The man asks Frankie if she needs help and she initially declines, but after thinking about it she decides to accept his offer. Wondering if her reason for locking her doors was because of a subconscious racial bias, Frankie decides that she’s going to stop making excuses for what she’s done. The episode ends with Frankie listening to a voicemail from Shay…despite the two haven’t spoken since Frankie was kicked off the volleyball team, Shay called to check in on Frankie after hearing she’d run away. Finally, Frankie has seen the light! For the millionth time I’m going to point out that this storyline hasn’t been about painting someone as a villain over something “trivial,” or serving as another example of people “pulling the race card.” Frankie is not a racist and she had no malicious intent, but her actions were racist and she refused to acknowledge that. The actions of other players on Degrassi’s volleyball team, Northern Tech’s team or any of the people harassing Frankie online or in person are irrelevant to Frankie’s individual actions, and you shouldn’t be hung up on some idealistic view of a world where everyone in a situation is appropriately reprimanded for their behavior¹. That’s not how the world works and we know it, and whether anyone wants to believe it or not Degrassi has been shifting more into the realm of “art imitating life” (that’s why “problematic faves” have become more of a thing in Next Class). “I think that you don’t get it, and I think that you’re not trying to get it,” Jonah says, and we know those stern words were written by Degrassi for more than just Frankie Hollingsworth. Jonah’s stood by Frankie throughout this ordeal, trying to show support for his girlfriend while she’s having a rough time. However, he has no choice but to call her out when her decisions start affecting their relationship and Frankie’s home life. One of the big things in Degrassi: Next Class is that we’re watching some characters become self aware as they deal with situations, actually taking the time to think about their behavior. We’ve finally hit the trifecta with the Hollingsworths, because all three kids in this Dysfunctional First Family of Degrassi have taken steps back to look at themselves and think about not just what they’ve done, but why they did it and how it affected other people. For Frankie that means thinking about why her initial instinct was to lock her car door. Was it simply because a stranger approaching her made her nervous? Was it because it was a male? Was it because said male was black? Why would one be afraid of someone offering a helping hand? Prejudices go well beyond people doing them with malicious intent. Even thinking about it outside of this racism storyline, we all have cognitive biases that affect how we perceive and treat other people, and the crazy part is most of the time we’re not even aware of it. * On subscript ¹: Looking at Degrassi’s volleyball team in this (excluding Shay) is tricky because they’ve sort of been a plot device during this whole thing. I will say that Northern Tech’s prank wasn’t okay, and neither is any of the harassment Frankie’s received from anonymous trolls and through comments like Baaz’s. However, in the context of Frankie’s plot their actions still don’t matter; you can’t control how other people act, but you can forever and always control how you react. *On subscript²: Just like when incidents like this happens in real life, I don’t expect strangers to ever forgive Frankie. Her friends, however, I’m hoping deep down still believe that she’s a good person who made a mistake. TINY PLOT SUMMARY: We see Shay and Tiny are starting to reconnect when she offers to help Tiny apply for a science summer camp at Caltech. At the same time Tiny’s suffering from unknown stomach pains; Shay says he should see a doctor, but Lola tells him all he needs to do is visit her homeopath. Tiny agrees to follow Lola’s advice and ends up with some pills that may or may not work. Later, Grace points out that it’s clear Tiny likes Shay, but Tiny doesn’t want to just break up with Lola because he still cares for her and appreciates everything she’s done for him. When Tiny meets up with Shay to work on his essay, his stomach pain flares up and Shay demands he get to a doctor immediately. 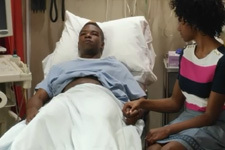 At the hospital the doctor initially thinks Shay is Tiny’s girlfriend, and he tells them that Tiny has appendicitis and needs emergency surgery. Lola bursts in and thanks Shay for taking care of Tiny, and she apologizes for not having taken Tiny’s symptoms as seriously as she should’ve. Later, Lola tells Tiny that she loves him, but he finally tells her that he also has feelings for Shay. He’s confused about which girl he cares about more, but Lola decides to end their relationship because she has no interest in being anything other than his first choice. Messy. Problematic. Toxic. These are the buzzwords that get thrown around a lot when describing relationship drama on Degrassi, and none of them apply to how the characters handled things in this plot. Tiny is the best male character on Degrassi right now and it’s easy to see why, especially when compared to his best friend. “Hey that is not a real thing,” Zig says when Grace mentions that Tiny is starting to emotionally cheat on Lola. Not only would I say emotional cheating is a real thing, but I’m a believer that it’s far worse than the physical kind. And you know Tiny’s feelings for Shay are resurfacing at an alarming rate when the two are talking about science, something they haven’t done since Next Class Season 1’s #NoFilter. Breakups are a reality most people don’t want to face, especially when you’re breaking up with someone who hasn’t wronged you, so the best thing you can do is to just be straightforward with the other person. Not only does Tiny admit to Lola that he has feelings for someone else, but he actually mentions Shay by name. On the other hand, Lola has every right to be upset. We saw in #BuyMePizza that she has commitment issues, and right as she makes herself the most vulnerable she’s ever been (saying “I love you”) Tiny drops a bombshell on her. What’s really impressive about Lola here is that when Tiny says he cares about both girls and it’s got him confused about his feelings, she takes the initiative to end their relationship. “I’m no one’s second choice,” she says before storming out, and that’s absolutely how she should feel. Instead of begging Tiny to choose her or feeling sorry for herself, she has enough self worth to not want to be with someone who’s on the fence about their feelings. Degrassi presents us with another situation where there are no “sides” to choose from, just two people handling a breakup the best way they can. That’s pretty underrated in my book for a show as relationship heavy as Degrassi. *Degrassi’s trying to send Tiny to Caltech for the summer…remember which former student is currently enrolled there? *Tola’s breakup seem draws similarities to Jimmy and Hazel’s breakup in the TNG Season 5 episode, Redemption Song. While Tiny was straightforward about his feelings for another girl, unlike Jimmy, both Lola and Hazel (two characters who aren’t taken that seriously) stood up for themselves when it counted most. ZOE PLOT SUMMARY: Zinston and Triles engage in a friendly wager to see which one is Degrassi’s cutest couple based on who’s post receives the most likes. While filming a video Winston trips, almost gets hit by a guy on a moped, but recovers just in time to elegantly give Zoë her beverage. The Hastygram video ends up getting reposted by Youtuber Shane Dawson, which results in Zinston’s video becoming a viral sensation with thousands of reposts. Later during their date, Zoë’s more focused on figuring out what their next viral video should be than on spending time with Winston. He thinks that Zoë doesn’t think they’re actually an awesome couple unless the internet is saying they are, so he walks out on their date. Upset, Zoë self harms by burning her wrist over a candle and posting it to her Hastygram with the hashtag #lovehurts. The next day, Tristan confronts Zoë for her reckless post, and she calls him out for not supporting her during her tough time instead of judging her and demanding she come out already. Winston ends up apologizing for walking out on their date, and when he spots Zoë looking at the relatable posts in the #lovehurts tag on Hastygram she lies and says she clicked on the tag by accident. I didn’t read the description for this plot going to into this episode, so I received a wonderfully rare blindside when this plot went from really fun to really dark in the blink of an eye. The social media component of this story is entertaining as Triles and Zinston brag about their digital clout. There’s a commentary hidden in there about the randomness of viral content; Winston tripping is a total accident that garners them thousands of reposts. Then Zoë spends the rest of the episode trying to artificially recreate that success, but her heartbreaking #lovehurts post barely receives any attention. Despite my glowing review of the support Winston gave Zoë during #ToMyFutureSelf, it doesn’t change the fact that their romantic relationship isn’t real, and Zoë’s at a point where she isn’t even trying to hide it. Winston’s been the voice of reason when it comes to Miles for forever, so of course he knows something’s up when he catches Zoë browsing the #lovehurts tag on Hastygram. But where this plot shines is Zoë standing up to Tristan for how he’s treated her when it comes to her sexuality. These two have a very blunt friendship, but Tristan has taken it upon himself on multiple occasions to tell Zoë how to handle her sexuality, instead of showing her the type of emotional support she’s been receiving through a fake relationship with Winston. She might be gay, but it’s more than just Tristan’s solution of her coming out that would make everything okay. “I’m trying to be happy,” she says when Tristan asks if she’s trying to stay in the closet forever. As we saw in #BuyMePizza, there’s still an intense struggle within Zoë between who she really is and who she’s trying so desperately to be, and it’s tearing her apart. *If you wanna get super deep, you could try making parallels between Zoë and the Goya painting Mr. Perino introduces in class, Y son fieras (And They Are Like Wild Beasts). Degrassi does have a bit of reused dialogue, like Mrs. Hollingsworth’s “You’re grounded, obviously” was said before by Mrs. Matlin in Spiderwebs. If you want to talk about reusing dialogue, Becky’s break up with Drew and Vijay’s break up with Tristan both used the “You’re not breaking up with me — I’m breaking up with you!” line. I loved zoe’s part because it is true that people who have an easy time coming out often shame other or pressure them to even if they aren’t ready. I also think her words of wanting to be “normal” was important because thats truly how if can feel sometimes when ur first becoming comfortable with yourself especially at a time as hyper sexualized as high school. I like that “Degrassi” is showing a difficult coming out story for a girl. Alex and Fiona seemed to accept their sexualities pretty easily, while most of the show’s main gay male characters faced challenges with accepting that they were gay. It’s important to keep in mind that girls may face just as many challenges as boys with coming out. True, however Degrassi is guilty of bisexual erasure, as characters who have had relationships from both sexes were not referred to as bi. Also, Yael’s character was originally supposed to be a butch lesbian, and they haven’t had one in Degrassi, only femmes. Yeah, I’d like to see a non-femme lesbian character on the show. Or someone actually admit to being bi. When Imogen was referred to as a lesbian, and didn’t make the correction, I was a bit taken aback. Gorgeous writing, Kary, just gorgeous. The way you turn such phrases like, ”brag about digital clout” makes me just stop for a moment to really enjoy it. I wish Shane Dawson would find out that he was name-dropped on the show. He was obsessed with TNG. He interviewed Aislinn Paul a while back! The interview is on Fullscreen and will be hitting SoundCloud and iTunes in the weeks to come. Triles and Zinston is a great dynamic. It’s like Paris but minus Maya. Ugh, I hate it that Lola tells Tiny that she’s no one’s second choice in this episode but then in the following season she spends the whole time being Miles’ second choice. I have to hand it to the writers for making Tola something real. Yes, everyone and their best friends were all shipping Shiny when DNC kicked off, but there was some real emotional growth between the two, especially on Lola’s side. My only wish for her is that she finds someone who would put her first. I,m glad that Frankie came to her realization instead of staying in denial — something that her mother used to do all too well. Shane Dawson knew about the namedrop almost as soon as the episodes were on Netflix. He was tweeted to about it by his fans and replied.